Today in Masonic History Jess Conrad is born in 1936. Jess Conrad is a British entertainer. Conrad was born Gerald Arthur James on February 24th, 1936 in England. He his youth he was nicknamed "Jesse" after the American outlaw Jesse James. When Conrad began acting there was already an actor named "Gerald James." 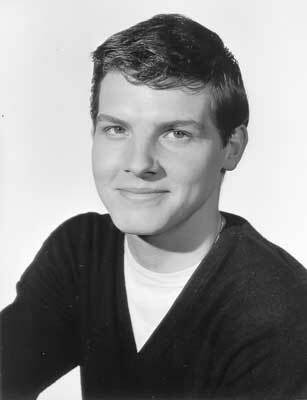 A drama teacher who was a fan of actor Joseph Conrad, a Polish-British writer, suggested the stage name of Jess Conrad. Conrad began his career as a repertory actor, an actor who performs with a regular company, and a film extra. He was cast in a television play, Bye Bye Barney as a pop singer. This led to other television series and to him recording with several record labels. He had several chart hits including "Cherry Pie", "The Pullover", "Mystery Girl" and "Pretty Jenny". In the 1950's and 1960' Conrad appeared in several films including Serious Charge, for which he is uncredited, The Boys, Rag Doll, K.I.L. 1 and Konga as well as Michael Powell's The Queen's Guards. By the 1970's Conrad was appearing in musicals on stage as well as beginning to appear in documentaries. Unfortunately at the time his earlier music was falling out of favor with audiences. In 1977, no fewer than 7 of Jess Conrad's singles were included in the "World's Worst Record" list. Eventually the list was turned into an album. On the show contestants who did no make the "big break" were given a box set of Conrad's hits as a "booby" prize. In the 1980's and 1990's Conrad continued to make appearances on television as well as films, including a variety of documentaries. In some of the documentaries, Conrad told stories about violent encounters with other famous people. This included biting off part of the nose of singer Heinz Burt and threatening to cutoff comedian Frankie Howerd's ears if he did not stop with unwanted sexual advances. Conrad was appointed an Officer of the Order of the British Empire in 2011. Conrad is a member of Chelsea Lodge No. 3098 in London, England. The membership is made up of entertainers.